Looking to advance me dancing skills and meeting new people. 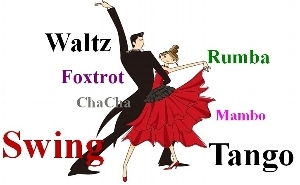 Latin dancing for fun and fitness. Looking for dance lessons with brother and sister in law, group preferred. Looking for some fun for my wife and I. Getting married 9/24/11 and we're dancing to Frank Sinatra's "Fly me to the moon". Need to learn some steps to get through it! I was taking Salsa in Philadelphia, however, with the long trip after a long day at work, it became too much. Interested in finding a comparable class close to home.